There she is . . . my girl. She has beaten the odds and made it another year. 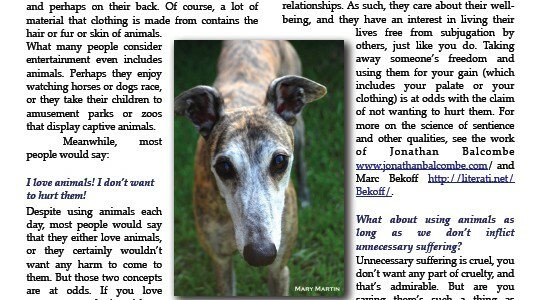 The life expectancy of greyhounds is 12-15 years. If they’ve . . .
Saturday was the one-year anniversary of the tragic death of my Charles Hobson Booger, III and it got me thinking about how easy he . . . I was going to change Animal Person to Vegan Atheist 40+ Parenting and come back to blogging. Doesn’t have a ring to it at all, but a young man at Whole . . .
After failing miserably at a long pamphlet in 2007, I decided to shorten it by 50% and focus on a different audience: people who use animals. I think part of the . . . The Drama of Project Treadstone, My 1000th Post! Well, I didn’t see this one coming. First, note to self, make sure the kind women who love the kitties don’t feed them 20 minutes prior to the . . . I was going to post a photo of Violet after she died. It looks just like this one, taken shortly before she died, but her tongue is slightly protruding. But then I thought some people might find that upsetting, which is odd after all of the gruesome images we’ve seen. SITUATIONS MATTER: Understanding How Context Transforms Your World (Riverhead 2011) by Sam Sommers, like the recent other nonfiction books I’ve read (and who am I kidding? The last novel I read was THE LIFE OF PI, and before that . . . THE POWER OF HABIT: Why We Do What We Do in Life and Business (Random House 2012) by Charles Duhigg is important for people transitioning away from the use of animals as well as people who study social movements. “Subliminal: How Your Unconscious Mind Rules Your Behavior” (Pantheon 2012), by theoretical physicist and bestselling author Leonard Mlodinow, is the perfect read after Hal Herzog. Herzog explained that people say one thing and do another, particularly when it comes to animals . . .